1) Michelangelo was primarily a sculptor – he did not want to paint the Sistine Chapel ceiling. In fact, he had never used fresco paints before. The pope at the time used threats against Mich’s country and family to convince him to do it. 2) Based on what multiple tour guides told us: In 300 AD, you would be killed for being a Christian. In 400 AD, you would be killed for not being a Christian. 3) Again, according to our guide, the Romans take incredible pride in the freshness and quality of their food. We were served a delicious cheese mixture that goes bad after one day. They claim only true Parmesan cheese can be purchased in their country. 4) Eating dinner is a long, multi-course, drawn out event. The waiter won’t bring you your check unless you ask them. A typical dinner start time is between 8:30 pm and 9:30 pm. 5) Our driver told us there are over 500 churches just in the city of Rome. The Vatican has more art, land, wealth, and authority than I ever imagined. 6) The gladiators were mostly prisoners and slaves. Some of the battles in the Colosseum were just a show, but most of them were battles to the death. A gladiator had to win 40 victories to earn his freedom. Then, he would become a celebrity, join the military, or take on the position of Gladiator Trainer. 7) The Romans prefer either distilled water or wine to drink with their lunch and dinners. I can’t tell you how many times I bought distilled by mistake because I couldn’t read the package – I even gave it the shake test unsuccessfully. 8) So many of the restaurants are small – that’s because they use to be homes that have been passed down from generation to generation. 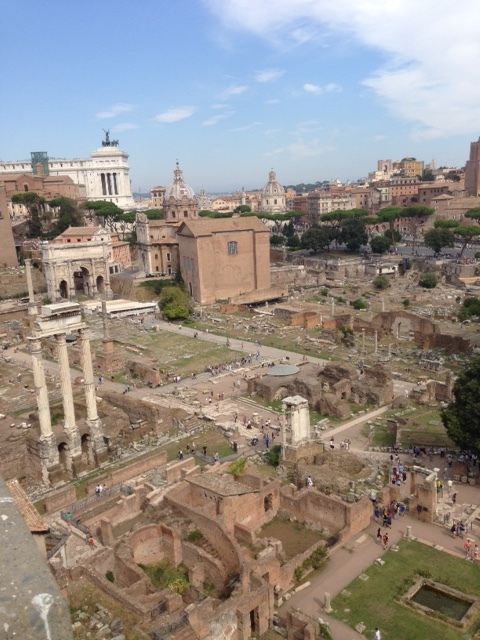 If you are brave enough to rent a space in downtown Rome – rent is usually 30,000 to 40,000 euros a month. Several of the locals complained about the large amount of taxes they had to pay. 9) In spite of the beauty, history, and splendor of Rome – the city has its share of poverty, scammers, graffiti, and homeless. Love this! What a fun adventure! Thanks Heather! Hope you get to visit there! Love hearing about the history….Wouldn’t eat dinner at 5, eh? Yes, 5 is just about the time to be finishing up lunch . . .